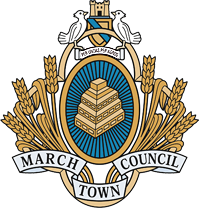 March Town Council | Aiming to encourage and support a prosperous, safe and healthy local community and a sustainable environment for all. March Town Council is based in the Town Hall, built in 1900 overlooking the Market Place. March is an attractive market town surrounded by fertile agricultural land. The course of the old River Nene winds its way through the town centre, past the park and pretty riverside gardens. The river is often busy with colourful boats cruising the Fenland waterways. The town centre has an unusual Broad Street lined with shops and headed by an elaborate ‘Fountain’ which was erected to commemorate the coronation of King George V. As well as a rich heritage March offers an array of independent and well-known shops, cafes, hotels, pubs and restaurants. The town is situated on the A141 which links to the A47 and A142 that provide excellent access to Huntingdon, Cambridge, Peterborough and to London and the Midlands via the A1, M11 and A14. There are direct rail links to Ely (for Cambridge), Peterborough, Ipswich and Stansted Airport.